The initiator of Tánceánia was Ildikó Bóta who has extended background both in dance and therapy. She worked as dancer/choreographer/teacher in several pioneering companies of Hungarian contemporary dance, and worked closely with Anna Dévény the creator of Dévény Special Manual Therapy which is widely used in the therapy for babies born with central nervous system disfunctions in Hungary. An important inspiration for the start was participating in Alito Alessi’s workshop, where she got introduced to the DanceAbility Movement – to its artistic and political goals and its basic working methods developed in ten years, since Alito Alessi and his colleagues started it. Ildikó started to develop the Tánceánia program in 1999, when she was leader of a movement therapy group at the Center for Supported Communication Methods of the Hungarian Bliss Foundation. The strict confines of the closed therapy group gradually opened up, and a performance group was established which started to produce public performances and demonstrations. At the same time other artists and therapists joined the group, bringing new therapy and art concepts (dance therapy, body awareness techniques, improvisation) which got integrated into the program. These ideas and techniques support us to experience a layer of body-mind-movement relationship which rather connects than separates people with different abilities. 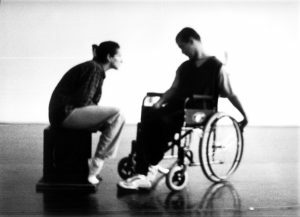 2) to work out a complex movement and dance therapy form for people living with severe movement disability, mild mental impair or speech loss and other special needs. 4) to eventually establish an art research centre which can be a basis for both the practical work of Tánceánia and can also be a scene for innovative meeting of similar relating efforts, and scene of a larger cultural, social dialogue helping integrate people of different needs in the society.